I keep making similar comments, but I just cannot get over how dense the wildflower displays are. I guess lavish or extravagant are more fitting terms. Just amazing. Over the past two weeks I’ve taken hundreds of photos of dense and extensive wildflower colonies. My challenge here has been to show pictures of them in varied enough ways that viewers don’t don’t find them too similar. I suspect nature photographers in still-cold parts of the country would love to have that challenge. “Just” another spring day in the life of south-central Texas. It’s hard for a photographer to come up short with so many scenes like this one. Sometimes the tele-lens-effect helps, though. Yes, you can get good compression of distances with a telephoto lens. At the same time, the longer the focal length, the shallower the depth of field. Many photographers live with that limitation and go for an effect where the foreground and background are out of focus and only a narrow band through the subject remains focused. 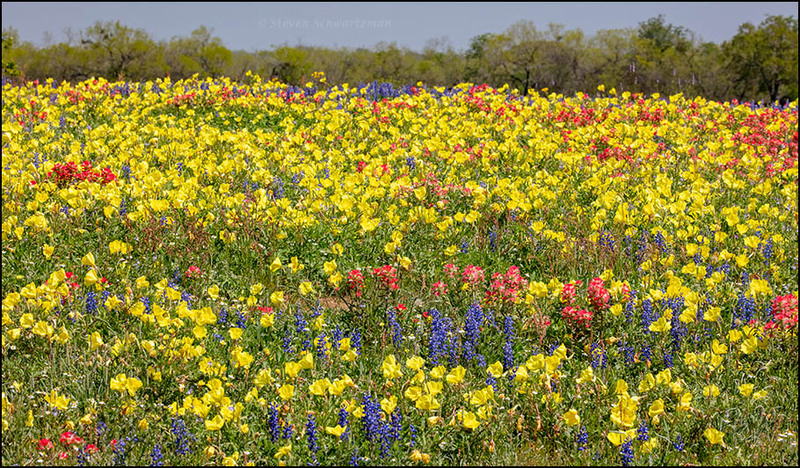 Welcome to the wildflowers in Texas in the spring. What gave me chills when I read that was realizing that not so very far away, northeast of the Flower Mound, is Melissa, Texas. That’s where my great-great-grandparents camped on the prairie during their brief stay in Texas. I have some correspondence to my gr-gr-grandmother from a friend who lived there at the same time, and I remember there are comments about the flowers. I certainly am going to dig those out again, and read them in this new context. This is a fabulous photo — so beautiful it brings tears to my eyes. What a special season this has been. I’ve been to the Melissa in Illinois but never the one in north Texas. Your ancestry ensures you’ll have to go there now, just as your interest in native plants entails a side trip to Flower Mound. Years ago, while Eve attended a two-day nursing workshop in Dallas, I spent some of my daytime hours checking out Flower Mound, which I’d heard of through NPSoT. It was October 4, 2006: no, I wouldn’t have remembered the date, but that’s what archives are for. Given the season, I photographed asters, goldenrod, Liatris, etc. The mound in question really is a hill that you can climb, whereas the one in today’s picture was pretty small. Still, that little rise was enough for me to use to block extraneous details in the background. If only I could carry a little mound like that around with me to hide unwanted things. What a treat to see this. I googled Poteet to get an idea of where you’re talking about, since I don’t know Texas geography. Some day I will get myself to Texas, but I know it will be hard to decide where to go! I’ve lived in Austin almost 43 years but until last week had never been to Poteet, even though it’s only a couple of hours away. The motivation to finally go was having seen online that the wildflowers in that area were going great, particularly in the cemetery that I highlighted in the previous post. Many other nearby sites, like this flower mound, proved photo-worthy as well. In terms of your visiting, central Texas from mid-March through mid-May almost always offers plenty to see in nature. I’m sorry for you, Tanja, but happy that central Texas is past any more freezes till late in the year. As we drove around the area, we came upon dozens and dozens of great wildflower colonies. We can get snow until well into May, but usually it does not linger. Today’s likely will be melted by Sunday. Most of our wildflowers will not bloom for a while, and I am curious to see which one will come first. You’re in good company: Thoreau used to record the date on which he first saw each species reappear in the spring. I have not been recording dates for flowers, but do so for birds, or Ebird does it for me, whenever I submit a checklist. Do you keep track of the dates when species first bloom? No, I don’t, though I’ve sometimes noticed that a species is unusually early. A beautiful sight, the primrose yellows glow. A pity there was a fence – the views low and close would be delightful. Almost all land in Texas is private, which usually means fences. I did what I could from a distance. So much yellow for evening primrose. I know we have some yellow sorts down south, but the evening primrose i remember in San Luis Obispo was pink, and grew on cliffs in the canyons. The flowers are all so similar though. Down here we’ve got a bunch of yellow ones and only a single pink one, though that pink one can form much larger colonies than the yellow. Now that you mention it, the pink ones that grow in flat areas here do happen to spread out very well. They just do not bloom profusely. I mean, they are spread rather thin. They are probably more profuse down south with this Super Bloom going on. I am not familiar with them, because I never got very close to them. The color is just like that of those that grow on canyon cliffs. I do hope you’ll get to see the superbloom before it fades. It is too far away. I have no plan to go there anytime soon. Bloom lasts a bit longer here, but is not as impressive. I’m with Robert~ we just never see such dense flower displays up here. What a treat. Then prepare to be treated to more wildflower colonies in the days ahead. Today we drove 178 miles. We saw people do that sort of thing in Montana, too, just casually hop in their pickup trucks and head out for hunderd+ mile drives. Amazing. Here I have to really want to get somewhere before I venture out more than 5 miles. It has to do at least in part with where in the country you are. Montana is the fourth-largest state by area but its population is only slightly larger than that contained within the city limits of Austin (if you count the metro area, you double our number). People in Montana are spread thin, so there’s that western tradition of going a long way to see friends, relatives, and even neighbors. Texas is the second-largest state by area, and especially in the western half there’s that same tradition of going a long way to do things. Yes in fact my folks in Montana maintain close ties in Texas. Your explanation makes sense. It’s a thing, then? Not just with my family? A limited thing: I traced that axis based on what you said about your family. Ah, ok. The way they speak of it you’d think it was a major migration route for Montanans. He was a border patrolman before he retired, I’m sorry to say. He still loves to wave his gun around and I’d hate to see what he’d be like if he were still on duty today. Divorce isn’t a nice topic, but I’m thankful my mom got away from him and married my step dad. It was he who introduced me to redwoods, and fishing, and in fact, art. I’m glad it worked out better for you. As for moving to Texas, that has been a trend for a long time among people in northern states who want a warmer place. Some are so-called snowbirds who come here for the winter and then go back north for the summer. Others move here permanently, sometimes for jobs or to escape exorbitant taxes and high cost of living elsewhere. Given my druthers, of course, I’d drag Paul to the Northwest. I may just give up and go by myself and live in a trailer or shack or tent or something. Wish it wasn’t so expensive. I remember hearing you say that before, but I don’t know if you’d enjoy being so alone, at least at the beginning. It’s true. I don’t thrive so much on my own. For all my big talk, I probably need to just stay where I am and find the good in it. And that’s in fact what you’ve been doing. You might be tempted to think it has to do with traffic, but I don’t think so. It is a mindset difference here. I’m glad you are willing to do it, though, and am eager to see the results. For me it’s a mixture of near and far. After yesterday’s 178 miles, this morning I spent time on the other side of my neighborhood and took just as many pictures on our seven-hour drive. The good thing is that when I don’t feel like going far, I’ve got a bunch of places right in my part of town. That really is a good thing. I have a silly question. You do occasionally show water and trees~ could a person live on water there? And surround themselves with trees? As is true everywhere, property along these lakes is valuable, and many people have built homes, sometimes quite lavish ones, on those properties. Of course, Texas being where it is, we don’t have the tall forests of the northern states, so you could be surrounded by trees here but might not get the same foresty feeling you’re used to. By the way, the Colorado River here is different from the one that flows through the Grand Canyon. This Colorado River is 862 miles long yet contained entirely in Texas. It sounds like I wouldn’t be able to afford to live by the water. I’m afraid you’re probably right. A few days ago we followed a little road for several miles along part of the eastern shore of one of the Highland Lakes, Lake Buchanan, and we couldn’t find one entry point to the lake; every single property was private. I suspect you’ll find lakefront property is highly valued everywhere, not just here. It’s true. I find I really resent how rich people close ranks around natural features like lakes. I confess I take some pleasure in knowing what will happen to those overgrown mansions when sea levels rise. And Lake Michigan continually chews away at its western shore~I’m sure I’ve mentioned that there are several houses beneath the waves there. HA! There are some fancy houses built right along Lake Austin, another of the Highland Lakes, that I think are just asking to be flooded. Upstream dams control the water level, but I expect eventually there’ll be heavy rain that’s sustained long enough that authorities will have to open floodgates. I expect you’re right. Also, dams silt up which raises the water level. Oh, my, what a kettle of fish that has become. Sand harvesting in LaSalle County here in Ill is ruining the way of life of many farmers for all of the reasons the so-called misinformed people are stating. I’m surprised the guy wants to get the sand from the stream. That is the most destructive approach he could have come up with. You made me wonder whether Amazon, which now sells just about everything, sells kettles of fish. I dunno about that but they do sell stock tanks, which I want to buy to house tadpoles. What fun it will be to have frogs hopping about on my terrace. Oh, that is interesting. I then typed in “pollywog” but they weren’t impressed. Right, I saw that but they don’t have much else to say about it.